Vancouver South Tower – Rogers Arena – Update. 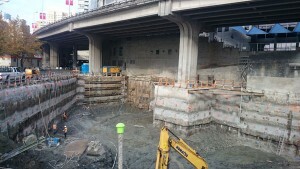 The new South Tower, adjacent to the Dunsmuir Viaduct and the Rogers arena is progressing in the excavation. With a current depth of approximately 30 ft right next to the piers of the Dunsmuir Viaduct it shows an impressive image even though the excavation is only at its half point in depth. The monitoring equipment installed at the affected piers monitor any possible movement in rotation or displacement. Until today, no alarming data has been observed. Engineering at its best in the core of Vancouver.